Schaeffer Oil | Schaeffer Oil | Mike Ryterski has a big hand in success of lubricant manufacturer. 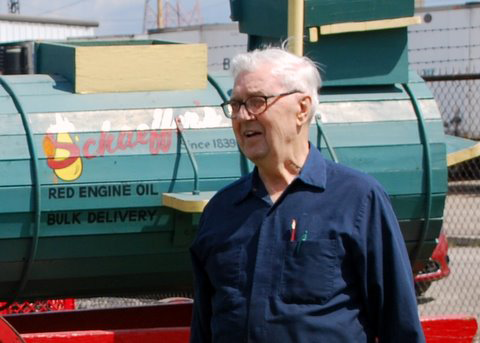 "70 years later, man is still on the job"
Mike Ryterski, 90, has a big hand in success of lubricant manufacturer. Let the National Bureau of Economic Research's Business Cycle Dating Committee throw all the data at its disposal into the argument that the recession officially ended in June last year. For thousands upon thousands of residents of metropolitan St. Louis, the specter of the recession's end remains as elusive as a job offer. What follows, though, is the story of a guy who beat the odds. His name is Mike Ryterski. And he landed employment in the dark days when the local jobless rate was still stuck in double digits. If you think it's tough finding a job now, keep that number in mind when considering what Ryterski faced the day he turned up hat in hand at the Schaeffer Manufacturing Co. The double-digit jobless rate he beat when Schaeffer extended its offer wasn't the piddling 10.8 percent the region hit when unemployment peaked here in October 2009. No, sir. The year Ryterski first punched the clock at the family-owned lubricant manufacturer - a south St. Louis institution since 1839 - almost 15 percent of the country was out of work. Which was somewhat of an uptick given that 23.7 percent of the nation's workforce had been out of a job just eight years before. Because, you see, Schaeffer hired Ryterski in 1940. The U.S. Bureau of labor statistics says the average salaried or hourly employee switches jobs every 4.4 years. Economists have extrapolated the tenure data and say most of us can thus expect to report to between seven and 10 employers over the course of our working life. The BLS said Americans born toward the end of the baby boom held an average of 11 jobs from the time they were 18 until they reached 44. Don't tell Ryterski. Now 90, he's been with Schaeffer for 70 years (and counting). Ryterski arrived near the tail end of the century-long phase when the manufacturer was known primarily for its production of candles and soap. Starting salary: 40 cents an hour, give or take a couple cents.